Corporate Sponsor ($500): You will be acknowledged by having your company’s banner on display at the clubhouse during the event, with your logo in a printed thank you advertisement immediately following the tournament, and with a logo and link displayed on our website at www.hancockcountyhabitat.org. Hole Sponsor ($100): Your company’s name will be prominently displayed at a tee box or green, will appear in the newspaper thank you advertisement, and will also be listed on our website. 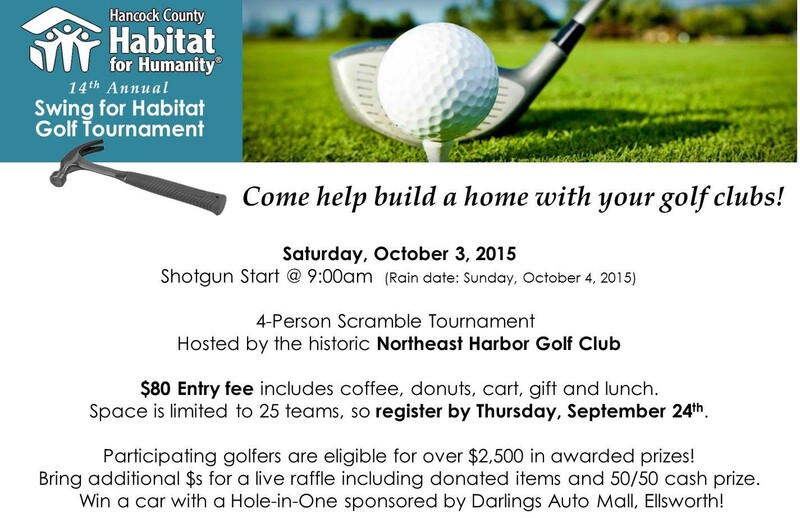 Foursome Scramble Team ($80 per player)—enjoy the fall foliage as you golf, warm up by the clubhouse fire afterwards, and partake of the yummy food served both before and after tournament play.